Colleges and universities are extending recruiting efforts and reach by offering new services to their admissions constituency during the years leading up to enrollment. 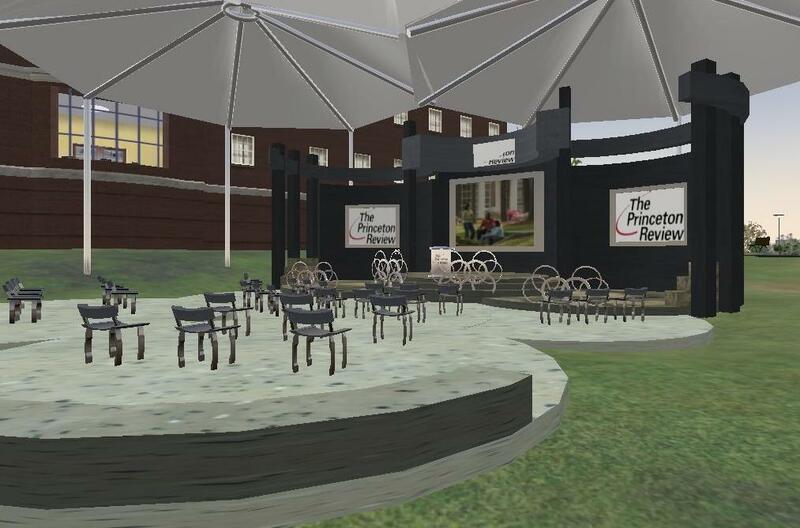 Ohio University and the Princeton Review have added an interesting option to the "reach" of these services: a series of SAT strategy sessions in a Second Life site within the Ohio University island at Second Life. The Princeton Review, www.princetonreview.com, already has its SAT LiveOnline courses, and Ohio University already has an island and an expert Second Life (SL) developer, so this coming together of interests seems a natural outcome. When you go to Ohio University's island in SL, you see what OU considers a close replica of the real bricks-and-mortar campus. That in itself has value for interested high school students who haven't yet visited the campus. The key question, of course, is what "value-add" there is in holding the SAT sessions in Second Life. You see in front of you your avatar. The avatar won't look like you unless you do a lot of re-design work, but it's easy to identify with that "person" anyway. It's very hard not to spend time exploring - you hear ambient sounds, see other avatars, enjoy the beautiful designs and maybe even meet a person. It's not exactly like being on the campus, of course, but it may be a psychological step up from using the Princeton Review's conferencing system in terms of imaginative presence and engagement. The initiative sponsored by The Princeton Review and hosted at the Ohio University virtual site started in January with two sessions, the last one on January 31, 2008. They were called "SAT strategy sessions." High school students from Ohio, the country, and the rest of the world could attend. This was The Princeton Review's first venture into a virtual world. According to the Ohio University press release (http://www.ohio.edu/outlook/07-08/January/260.cfm), Michael Reiss, Princeton Review's online marketing manager, worked with OU Engineering Professor Chang Liu, Director of OU's VITAL Lab (Virtual Immersive Technologies and Arts for Learning Laboratory) to launch the first strategy sessions. The University chose the adult grid at Second Life to host the events. SL also has a "teen grid" but OU chose the adult grid because "the population of the adult grid is vastly larger than that of the teen grid." But, at the same time, Reiss said, "we have not ruled out the teen grid as a possibility in the future." The most important outcome for the student attendees may be that, while at the OU island, they could talk with other attendees. SL adds a social element to online SAT preparation and to any event held in SL. Oddly, Second Life may be adding back the traditional face-to-face value of preparing for the SAT.